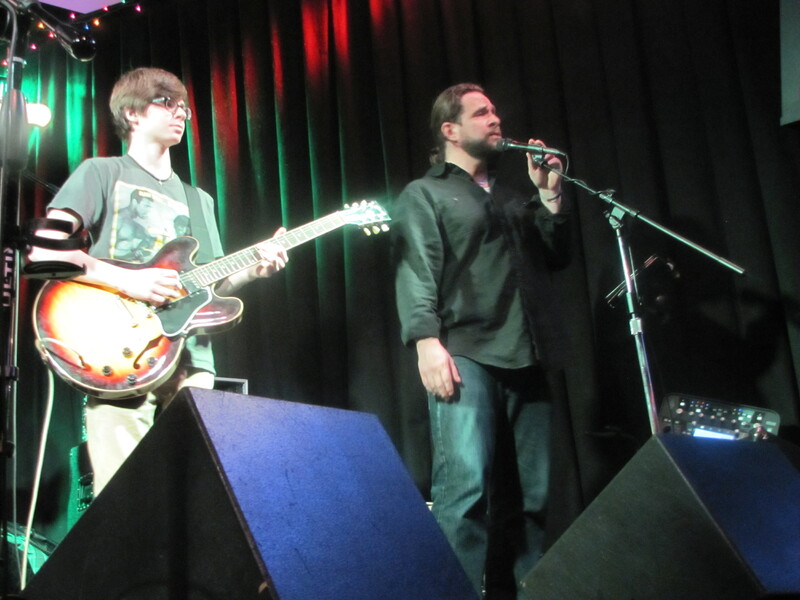 Hayden Fogel, left, David Michael Miller perform in the Sportsmen’s Tavern. When Todd Eberwine announced his plans to take a hiatus from Dive House union early in December, an outpouring of fan support, tempered with concern, ensued. One of the best loved and most successful of Buffalo’s current crop of independent bands, the group won over its audience by presenting itself as a wholly cohesive unit, one for whom on-stage interplay and inter-band communication seemed to take place at an entirely sympathetic and perhaps even telepathic level. Guitarist Eberwine has always been a significant part of that equation. How would the band survive without Eberwine? And what would Eberwine be doing during his hiatus? On Sunday, enough people blew off the Bills game to head to the Sportsmen’s Tavern in order to take part in a farewell performance and open-ended jam session to celebrate and honor Eberwine and DHU’s legacy. The Bills lost. Fans of Eberwine, DHU, and top-level soul, R&B, blues and rockwon out, big time. The packed club was treated to an emotional, impassionedperformance from a band that featured a core of DHU members – Eberwine,guitarist/vocalist David Michael Miller, bassist/vocalist Dave Herr,saxophonist Barry Arbogast, keyboardist Tom Scime, and drummer Shannon Street –with special guests including young blues prodigy Hayden Fogel, bassist Rod Horning, and blues legend Mr. Konrad, among others, taking turns sitting in. Not surprisingly, the level of musicianship was uniformly high through out the evening, with Miller, Arbogast and Eberwine trading solosduring a transcendent “Sand,” or Fogel offering a searing Chicago-style blues solo during “Standing on Solid Ground.” That said, it was the air ofcamaraderie, and the shared sense that we were perhaps witnessing the end of an era, that leant the evening a sense of the bittersweet. DHU has long been an incredibly powerful and soulful unit. This version of the band ended as itbegan, with its spirit of deep friendship and musical integrity intact. Doubtless, Eberwine will continue to make music in various formats of his own choosing, and DHU has made a commitment to carry on in hisabsence. What waits around the bend is anyone’s guess. But paths that cross tend to cross again. Among the many musicians I ran into at various gigs this week was drummer Tony Parisi, whose band. Child of Folly, recently released its debut EP, tracked over the summer at Robby Takac’s GCR Studios. Parisi, who I’ve encountered on several occasions, waxed ecstatic about the experience, and has urging me to check out the band for the past few months. At long last, I cleared some time – well, ok, I woke up in the middle of the night, couldn’tget back to sleep, thought ‘There’s no time like the present,” and dug into the EP. What I found there was a beautifully recorded and produced collection of soulful, funky and delightfully eclectic tracks built around strong grooves and peppered with surprising instrumental flourishes. Immediately, I was struck bythe gritty intensity keyboardist/vocalist/lyricist Beau Brook’s singing. The guy’s got considerable soul and a penchant for biting, staccato phrasing setagainst strong melodic hooks. You can hear as much during thepsychedelic-sunk-soul strutter “Stone Cold Liar,” which finds Brooks trading phrases with co-vocalist Jess Chizuk atop a Black Keys meets Black Crowes groove. It’s a killer. You can check out the whole Child of Folly EP on the band’s Soundcloud page. (Soundcloud.com/Childoffolly.) You can also cath them live, at the Forvm in the Maple Entertainment Complex on Jan. 11. Music freaks can be tough to buy gifts for. The essential quandary is this – they are pretty much only interested in music, and yet, they already have so much music in their collection that woe betide the person trying to fill whatever holes might remain in said collection. Basically reimagined a mass of material I’ve been familiar with for decades. What do you give the music-lover who already has everything? A friend of mine answered this question by sending me a Soundcloud link this week that reimagined a mass of material I’ve been familiar with for decades in an incredibly refreshing manner. Dubbed “Every Thin LizzyGuitar Solo 1973-1983,” the 90-plus minute lived up to its name by offering a mash-up of the Irish band’s finest six-string throwdowns, and brought a smile to my face, one that is likely to last well past New year’s Day. The moral of the story? Well, aside from the obvious one – Thin Lizzy belongs in the Rock and Roll Hall of Fame, lol – this gift proves that, by thinking outside of the box, you can still find something that will surprise your music-obsessed significant others. Check this out: soundcloud.com/londonlondoncompany/every-thin-lizzy-guitar-solo.